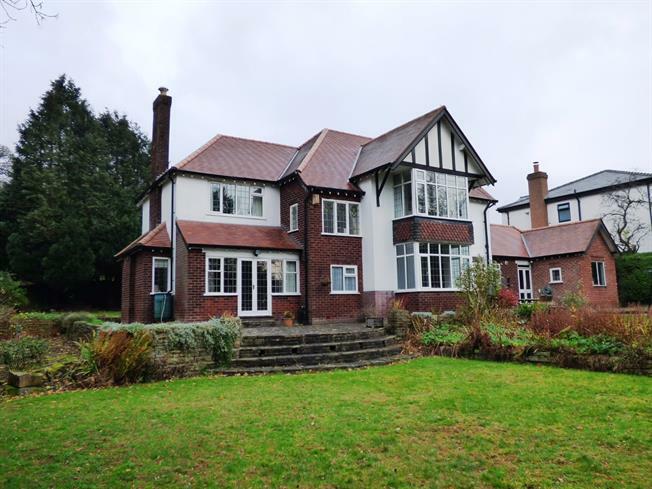 4 Bedroom Detached House For Sale in Stockport for Guide Price £650,000. 'Alder Lodge' is an impressive 1930s detached family home ideal for an extended or growing family. The room sizes throughout are generous and improvements have been made whilst retaining it's original character and charm. In brief a porch, entrance lobby with fireplace, cloakroom WC, lounge with inglenook, dining room, morning room, dining kitchen and a utility room. Landing, four double bedrooms and a stunning bathroom. Other features include a 24'5 x 8'7 attic, 30'5 x 9'3 tandem garage and a large rear garden. Main entrance door. Tiled floor. Leaded windows. Glazed entrance door with leaded side windows. Oak floor. Art deco tiled feature fireplace (decorative use only). Strapped ceiling. Staircase leading to the first floor accommodation. Oak panelled walls. Two double radiators. UPVC double glazed window to the rear elevation. Two piece matching suite comprising a wall hung WC and matching vanity wash hand basin. Timber effect flooring. Chrome effect fittings and attachments. Single radiator. Secondary double glazed windows to the front and rear elevations. Inglenook fireplace complete with a gas coal effect living flame fire and sandstone fire surround. Two double radiators. French patio doors opening out onto the rear garden. UPVC double glazed bay window to the rear elevation. Single radiator. Strapped ceiling. Plate rack. UPVC double glazed French patio doors to the rear elevation. Double radiator. Secondary double glazed windows to the front and side elevations. Fitted matching range of wall, base and drawer units with work tops over. One and a half bowl and single drainer unit with mixer tap. AGA. Double radiator. Halogen down lights. UPVC double glazed window to the rear elevation. Twin sink. Plumbing for an automatic washing machine. Tiled floor. Storage cupboard. Glazed rear door. Quarry tiled floor. Storage cupboard. Access to the garage. Access to the attic. Stain leaded window to the rear elevation. Bannister rail. Single radiator. UPVC double glazed windows to the front and rear elevations. Floor to ceiling height fitted wardrobes. Two radiators. UPVC double glazed windows to the front and side elevations. Single radiator. Floor to ceiling height fitted wardrobes. UPVC double glazed bay window overlooking the enclosed rear garden. Double radiator. Secondary double glazed window to the front elevation. Single radiator. UPVC double glazed windows to the rear and side elevations. Four piece modern suite comprising a wall hung WC and vanity wash hand basin, wet room style shower with glass partition. Halogen down lights. Tile covered walls and floor. Built in linen cupboard. Chrome effect fittings, attachments and heated towel rail. Access via a pull down timber loft ladder. Velux window. Power and lighting. Vaulted boarded ceiling. Whilst set back from the road the spacious frontage is mainly laid to lawn with a hard standing driveway providing off road parking for several vehicles. The boundary lines are clearly distinguished by stone walls and hedge line. Roller door. Windows to the side and rear elevations. Power and lighting. This large enclosed child/pet friendly rear garden is mature and well established. Whilst enjoying a high degree of privacy the lawn and perennial borders compliment the two stone paved patio areas.